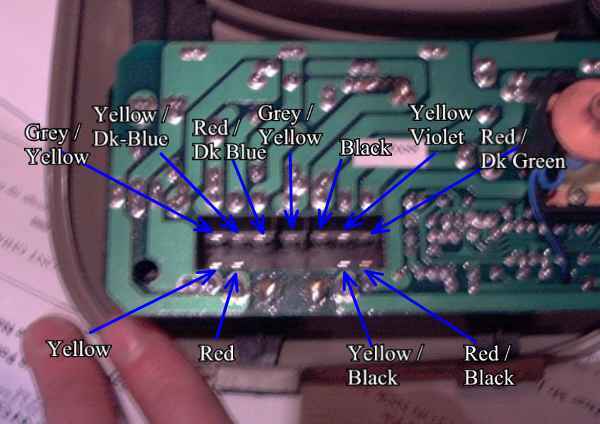 Firstly, Thankyou to Ugly Igly for pointing out the misprint with the Grey/Yellow Wiring on the Main Power Window Switch. This Error has now been corrected !. This Document describes the process of converting standard window Winding Modules, to Power Window Winders, as Fitted to Fairmont, Fairlane, LTD, and some Futura Models. Removing the Manual Window Winders, and Mounting the new Power winders. You will also require power window door trims, to remove the Hole made for the manual window winder, in the original Trims. Power Window Trims are available from some Futura models, and all Fairmont, Fairlane, and LTD models. An estimated cost for the 2 Door power window conversion is around $450, to $600, depending on Door trims, new or used parts to be used, etc. The cost for the 4 door conversion is estimated to be around $800-$1000, for 4 Electric Winders, Centre console switches, Door Trims, and other bits and pieces. The amount of time required Estimated at around a full day for each door to be converted. Finally, this is not a simple modification ! 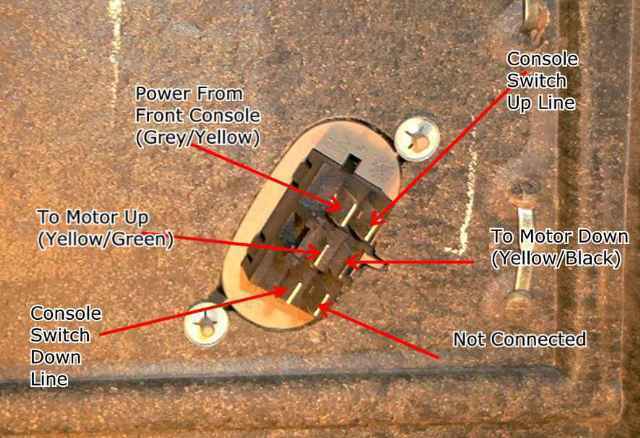 It is recommended that only experienced persons attempt this modification, as it requires some difficult wrenching, wiring, and a lot of time and patience ! Having said this, those that have successfully completed this modification have said that it was well worth the required time, effort, and money ! WARNING : This section should not be attempted unless you are prepared to fit the Power Window Winder at the same time ! Removing the Manual Winder will mean that the Window will not be supported, and consequently will not be able to be closed until a new winder is in place ! Obviously, you will need to remove the door trim, to get to the Manual winder mechanism. Information for this can be found at Adding Door Lamps to the Door Trims Technical document. Once the door trims have been removed, you will need to remove three large rivets that hold the Manual Winder Mechanism in place. To remove these rivets, you will need the 5mm drill bit, and a drill. Simply Drill out the Centre of the Rivet, which will then make the rivet easy to remove. Once these rivets have been removed, it will be possible to push the winder rod out of its mounting hole, by pushing it inside the Door. Once this has been completed, you will need to remove the 3 Bolts that hold the Window Guide on to the Door. See the above figure for the position of these Bolts. Also, remember that it is possible once these bolts have been removed, that the window will become loose, and may drop ! Take extra precaution when carrying out this step, especially if you have tinted windows, as it is possible that you may scratch the window tinting film whilst carrying out these steps ! Once these bolts have been removed, you will notice that the guide assembly, window rod, and window will all move ! Finally, you will need to disconnect the Window from the Winder Assembly. The Window is held on to the Assembly with 2 further Bolts, and a small bracket. WARNING : Take extra care with this step, as the window will drop when these bolts are removed. It would be a good idea to hold the glass in place when removing the last bolt from the Winder Assembly ! Once all the bolts have been removed, carefully remove the Winder assembly from the bottom of the door, and carefully lower the glass so as it sits inside the Door Frame. NOTE : It is a good idea while you have the winder Assembly outside of the door, to lubricate the Rubber Window Guides with some Dry Lubricant, and to also Lubricate the New Window Winder Assembly with some grease. This will assist with the power window operation when the conversion has been completed. Here is the Manual Window Winder Assembly removed from the Door Skin. The next step is pretty much the reversal of the above section. This will take approximately 30 Minutes to complete, and compared to above process, is fairly easy but finicky to complete. You will notice that the New Power Window Regulator uses exactly the same mounting points as the Original Manual Window Winder. This means that you will not need to drill any further holes, nor alter anything to fit the new Winder. Firstly, lift the window so as it is in the Fully upright position. Next, feed the Window Guide inside the Door Frame, through the Bottom Hole in the Door Frame. Next align the Window Guide up with the mounting holes, and attach the Glass to the Winder. Once the Glass has been attached, Bolt the Window Winder guide in place, using the 3 bolts from the previous winder. Finally, the Winder Motor will need to be bolted in place. Align the Power Window Motor, with the 3 Rivet Holes where the previous rivets were removed. Next, Place a bolt in each hole, and attempt to screw a nut on to the end of the Bolt, inside the door trim. WARNING : Do not use Bolts longer than 2cm, as these will foul (Touch) the Glass when the window is wound down ! Finally, tighten all the Bolts, and nuts. 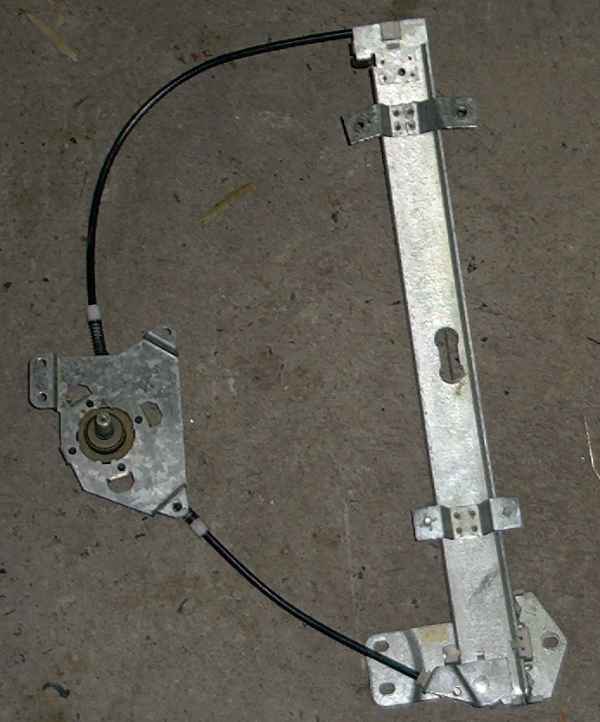 Once everything is in place, you can test the Power Window Operation by placing power to the 2 Power Window Motor Wires. Ensure that the Power window operates smoothly, without getting stuck, obstructed, or making excessive noise. If there is a problem, check to see all the guides are clean, and free of obstructions, and check that the Motor is Operating OK.
To get the Power Winder Motors to work from the Centre Console Switches, you will need to run an Extra 2 Wires (3 for Back Doors), from the Power Window Motor, to the Centre Console. You will also need to run a Power Line from the Ignition Switch, to the Centre Console Power Window Switches. Finally, you will need to run a Ground wire from somewhere, to the Centre Console. This part will take approximately around 1 to 2 Hours per door to undertake. Unfortunately, you will need to run very thick, high current cabling, so it is recommended that you use thin flexible cabling (If possible figure 8 wiring for the Front Doors), so as it is easy to run through the Rubber Door Conduit (The Tube that the factory wiring is run through from the Door, to the Cabin). Remember, the Cabling that you run must be able to handle at Least 10 Amps ! The easiest way to do this is to take your time, and use a Flat headed screwdriver, to get between the metal, and the Rubber Grommet that fits within the Door Trim/Chassis hole. Once this has been completed, you will need to run the cabling in to the cabin, to the Centre Console. Next feed the Door Lamp cabling through the Metal hole used for the Rubber conduit, and using the Door switch Hole and the Door Switch wiring as a guide, feed the wiring out from behind the Kick panel. Finally, you will need to remove the Front Seats, and Run the Cabling underneath the Carpet, down to the Centre Console, where the Power Window Switches are located. Also, be careful not to run the Cabling underneath the Front Seat Tracks, as the Pressure of these on the wiring could damage the wiring. Again, you will need to remove the Front Seats ! This is due to the Fact that the factory wiring Loom comes out from the Back doors, underneath the Carpet, below the front Seatbelt Reels. This is right down at the Floor pan level inside the cabin, so its a good idea to complete all the wiring at the same time, that way you do not waste time removing and fitting the Front seats each time ! Please Note : If you have front Power Windows Factory Fitted, then you will already have the Power Window Connector, complete with wires connected to the Centre Console Plug. Although this plug has been fitted by the factory, it will still be necessary for you to splice the new wiring that you have run to the Back Doors, to the existing wiring. This is due to the factory Wiring being terminated somewhere inside the vehicles cabin, and not being available for use ! 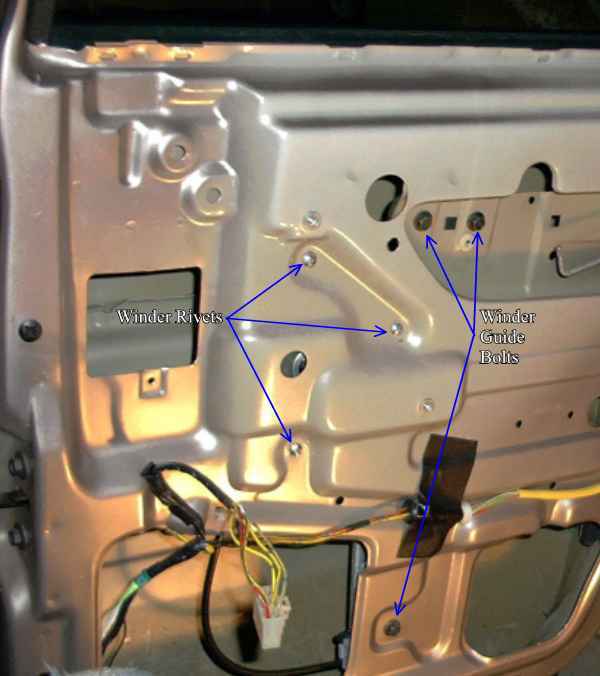 If you do not have any Factory fitted power windows, then you will either need to get the electrical connector for the Centre Console Power Window Switches, or you will need to connect the wiring to the Switches, via spade connectors. Also, if you do not have Electrical connectors for the rear power window switches, then again, you will need to make the necessary connections by using spade connectors. If you are converting the 2 front windows, then you will need to connect 6 Wires Only. 4 Wires for the two Front Power Window Motors. For a Four Window Conversion, then you will need to wire up 12 Wires. 8 Wires for the 4 Power Window Motors. You will need to make 5 Connections to the Back Door Power window switches for each door. This includes 3 wires from the Centre Console Power Window Switches, and 2 Wires from the Doors Power Window Motor. Once the power window winders have been fitted, you will notice that although the original door trims will still fit, there will be a hole present for the original Manual window winder. The only way to remove this hole is to replace the Original door trims with ones from a Power Window Model. You will also notice that door trims from power window models have an extended arm rest and handle, front map pockets, and depending on the model the new door trims have been removed from, you may also have wood trimmings, Leather, suede, carpeted map pockets, chrome door handles, sueded and padded armrests, rear door map pockets, and door lamps. Unfortunately, you will need to add 2 Screw Rivet Bolts to use Power Window Armrests in place. Please Note : You will require 2 screw rivets per door. Below is a picture of what the screw Rivet looks like, unfitted. 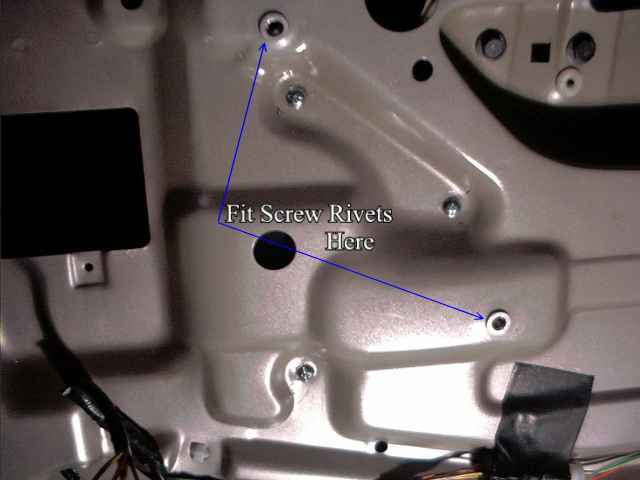 At first glance, it may not be apparent how the Ford Screw Rivets are held in to place inside the door trim. This is because you will need to expand the rivets. Normally there is a special tool that is used to expand the rivets inside the door trim, but because the tool costs $$$$$$, I have used an alternative method to fit the Rivets. 1. Find a Nut and bolt, that has approximately 5mm Shank, along with this you will need either 2 wrenches, or shifters that can be used on the Bolt and Nut. 2. Using the Nut and Bolt, fit the Screw Rivet on to the Bolt, and Tighten the Nut 1 turn. 3. The above would have expanded the Screw Rivet enough so as it will fit snugly inside the Door Skin. Please Note : You may require a hammer, to tap the Rivet in to place. If the Rivet is still loose, you can use the above method, with the rivet inside the Door skin, so as the rivet expands snugly in its hole ! Finally, you will need to remove the Standard Armrest Bracket, as this bracket is not used on the Power Window Door Trims. This Bracket is Pop Riveted on to the Door skin, using the same type of pop rivets that were used to hole the Window Winder Assembly in place. 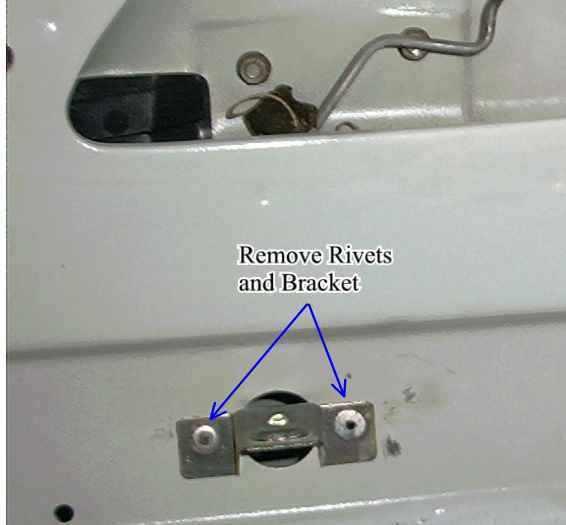 Below is a picture of the bracket that you will need to remove. Just like the Removal of the Window Winder Rivets, you can use a 5mm Drill Bit, and a Drill, and simply drill out the middle of the Rivet. Once all this has been completed, you can then fit the New Door trim, and enjoy your New Power Windows ! Document written by: Matti on 04 2002>, Copyright © 2005 Matti, all rights reserved.